The negative relationship between physical health and IQ is the most noteworthy finding, as it goes against the observation of IQ being associated with good health. To explain this, the authors propose either that "the course that leads from initial talent to extraordinary achievement may require pathways of intellectual and social development that diverge radically from normal personal growth," or "Excessive selection can truncate the variable variances so that correlations are reduced to zero. [...] As an example, among students accepted to graduate school in psychology, the undergraduate grade point average can be negatively correlated with scores received on the Graduate Record Examination (Dawes, 1975)." Relative to the average, IQ was higher among the philosophers and imaginative writers, but lower among the commanders, composers, and artists. Catharine Cox published two studies of highly eminent creators and leaders, the first in 1926 as the second volume of Terman's landmark Genetic Studies of Genius and the second in 1936 as a coauthored article. 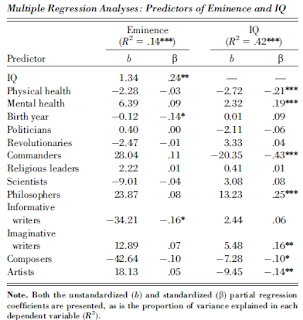 The former publication concentrated on the relation between IQ and achieved eminence, and the latter focused on early physical and mental health. Taking advantage of unpublished data from the second study, we examined, for the first time, the relationships among achieved eminence, IQ, early physical and mental health, and achievement domain. The correlation and regression analyses showed, for these 282 individuals, that eminence is a positive function of IQ and that IQ is a positive function of mental health and a negative function of physical health, implying an indirect effect of physical and mental health on eminence. Furthermore, levels of early physical and mental health vary across 10 specific domains of achievement. What does "eminence" mean? How is it defined in the paper? I make sense that more intelligent people on average tend to pursuit more intellectual activities, neglecting therefore their physical health. Inversely, people with less intelligence may tend to do the opposite, as intellectual pursuits are less attractive to them. Seems quite obvious that military commanders are notably dumb (not unexpected to me, sincerely). The relative low IQ score of artists and composers underlines that these creative intellectual abilities cannot be measured by the purely rationalist and verbal ruler of IQ tests (they do have major shortcomings indeed). Philosophers on the other hand, being highly analytical, score high naturally. Scientists nevertheless appear less outstanding in IQ skills, what may need an explanation. In this "grey area" of rather low positive and negative scores, I do find somewhat notable that revolutionaries score as significatively more intellgent than estabilished politicians. Overall, it doesn't seem to say much in favor of the status quo, with its favored classes (commanders, politicians and even scientists) not scoring very well overall. Seems quite obvious that military commanders are notably dumb (not unexpected to me, sincerely). Your anarchist sensibilities notwithstanding, the military commanders -or anyone else for that matter- were not dumb, as the range of IQs of all the studied persons started at an IQ of 111.25. They were simply not as smart as e.g., the eminent philosophers. Well, they are still very notably under the average ("dumb" is just an informal way of talking). Whatever the case, I insist: what does "eminence" mean in this context. "Seems quite obvious that military commanders are notably dumb (not unexpected to me, sincerely). "Quite obvious to whom? I'd put Marcus Aurelius above pretty much any man on earth (though he'd naturally put himself with the common man). A high IQ means nothing if all it translates into is a high score on a piece of paper. Take Chris Langan. He is a bouncer from Montana, and his IQ is said to be around 200. Though he has interesting views on ethics and metaphysics, he hasn't achieved anything notable in his life -- other than being talked about for his high IQ -- and, despite that IQ, lives what many would consider a pitiable existence. He could be researching a cure for cancer, finding ways to promote alternative sources of energy, teaching underprivileged kids somewhere out there; if he is a selfish hedonist instead, he could use his intellect to secure a vast fortune and have a wondrous harem of women; or if he's asexual he at least can be his own boss. But no. He works as a bouncer and can't even effectively communicate his ideas to those who fall in the gifted/genius range. He's also fat -- though media sources present him as "muscular" -- and thinks people like him should have priority in mating with hot women (note: most hot women like men with high IQs who actually bring results). His desire to bang hot, beautiful women and bring more Chris Langans into the world belies any pretense to rejecting the establishment for some spiritually beatific vision. IQ in and of itself is an asset -- but "eminence" is James Watson, Marcus Aurelius, Napoleon, Thomas Edison, Shakyamuni: individuals with extraordinary mental faculties who have the natural capacity, or drive, to produce. I am not going to argue with Sangha but I did ask in my first post and first sentence about the meaning of eminence as defined by the paper. This individual claims that "eminence" is the same as "genius", what is a nonsense. I thought that maybe meant social, political or otherwise public relevance. But so far I have found no satisfactory answers. * Éminence grise, or grey eminence, one who advises a leader in a secret, behind the scenes, fashion. * Eminence, a French brand of men's luxury underwear. * Eminence, a skin care supplier in the US and world wide originating in Hungary. I am not going to argue with Sangha but I did ask in my first post and first sentence about the meaning of eminence as defined by the paper.Just look at the group that Catharine Cox studied and find what they have in common -- thus what the paper defines as "eminent." Going off memory, they are individuals of above-average IQ -- many of whom are in the genius range -- who have made extraordinary achievements in their respective fields (e.g., philosophy, science, math, art, politics, military, etc.). This individual claims that "eminence" is the same as "genius", what is a nonsense. I thought that maybe meant social, political or otherwise public relevance. But so far I have found no satisfactory answers.The same word can have different meanings depending on context. I don't think any sensible person would equate eminence with genius (as defined by psychometricians) -- if you look at the individuals studied by Ms. Cox, you will find extraordinary achievements among all of them in their respective fields, a disproportionate number of whom have (had) an IQ in the genius range, but accomplishment is the unifying element within the group. IQ is incidental though no doubt helpful. Again, there is no need to get caught up with the limitations of language -- a very Western preoccupation. Just find commonalities and weed out any ideas that don't fit into the picture. Your own definition -- which is neither right nor wrong -- may differ from Ms. Cox's.